Location: North central Livingston County, 2.7 miles south of Avon. Starting in Avon at the intersection of Routes 20 and 39, turn onto Route 39 (Wadsworth Avenue) heading south. After 2.7 miles turn left (east) onto to Paper Mill Road. In less than half a mile there will be an entrance to a parking lot for Paper Mill Park on your left (north). As you drive along on Route 39 be sure to watch for the “Five Arch Bridge”, roughly 1.2 miles south of Route 20. Immediately past the bridge there is a small parking area on the west side of the road. The bridge was built by the Genesee Valley Railroad during the years of 1856-57. The 200 foot long by 12 foot wide limestone bridge spans Conesus Creek, the outlet for Conesus Lake. The railroad abandoned the bridge in 1941, and the rails were removed. The road originally went under the arch at the northeast end of the bridge. From the parking area for the Five Arch Bridge, continue south on Route 39 to Paper Mill Road, about 1.5 miles, and turn left. In less than half a mile there will be an entrance to a parking lot for Paper Mill Park on your left (north). From the parking lot walk to the east across the old bridge for Paper Mill Road. As you cross the creek, the crest of the falls will be to your left (north). Be sure to look to the south at the current bridge for the road. This bridge is built of local stone, and has two pink millstones set in the center, one on each side of the bridge. Continue across the old bridge to a small picnic area. From the picnic area a trail to the north reaches the best viewing area for the falls in less than 200 feet. 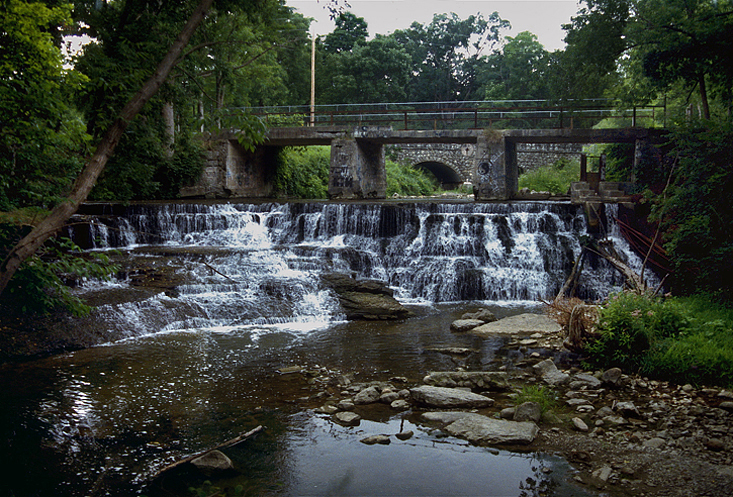 Paper Mill Falls has a height of 10 feet, a crest width of 30 feet, and faces to the northeast. The northwest side of the falls consists of a very steep cascade. At the center of the falls there is a vertical drop of about 3 feet that is followed by cascading. The southeast side of the falls is a gently slopping cascade. 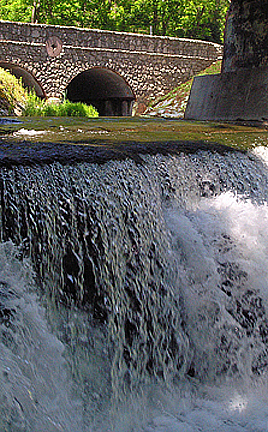 The water power of the falls was originally used to power the Wadsworth Flour Mill. A paper mill was later built on this site. Because this falls is found on the outlet for Conesus Lake, there is usually a good amount of water passing over it.